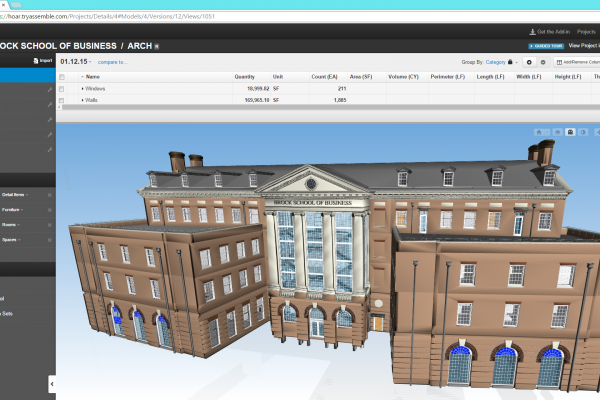 BIM Case Study – Founded in 1841, Samford University is the 87th oldest institution of higher learning in the United States. Located in Homewood, Alabama just outside of Birmingham, the university consists of 10 schools including the Brock School of Business (BSB). To provide state-of-the-art educational environment and meet the needs of future students, the university needed a new building to house the Brock School of Business. The newly constructed 4 story building includes multiple teaching labs, 11 classrooms, interactive breakout rooms, common areas, and a community resource forum able to host up to 400 guests. Based on a competitive interview process and their reputation of being progressive builders, Hoar Construction was selected as the general contractor even before the design of the building was complete. Davis architects was the architectural firm already on the project. By having Hoar Construction on board early in the project life-cycle the design team was able to make more informed decisions, which resulted in efficiencies throughout the project and helped further strengthen the relationship between all project stakeholders.